Songs for the young at heart. This program is designed with children of all ages in mind. Both young and old alike enjoy this educational and entertaining musical program. The audience is an integral part of the performance, and everyone gets involved. All of her programs welcome children, though this program is designed specifically toward children and their families. Great for an afternoon concert along with one of the other evening concerts. This is great for libraries, schools, community centers, churches, etc. Songs to lift the spirit and celebrate women. These women’s music programs are truly inspirational! Through her music Susan celebrates the lives of women and the threads that connect us all. Music can express the power and unity for women in many roles, both past and present. Great for mother daughter concerts, fundraiser’s, or celebrating Women’s History Month which is in March. If you are interested in hiring Susan for a fundraiser for your women’s group or environmental organization, please talk with her about also lining up some school programs, or a family concert in the area to help assist to pay her expenses. 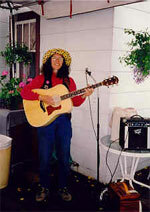 Susan has performed for many Elderhostel groups in Alaska as well as in Michigan and Kentucky. 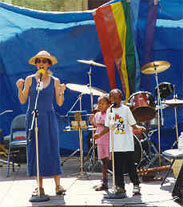 Susan has performed for many festivals, fairs, outdoor celebrations, fundraisers and concerts.